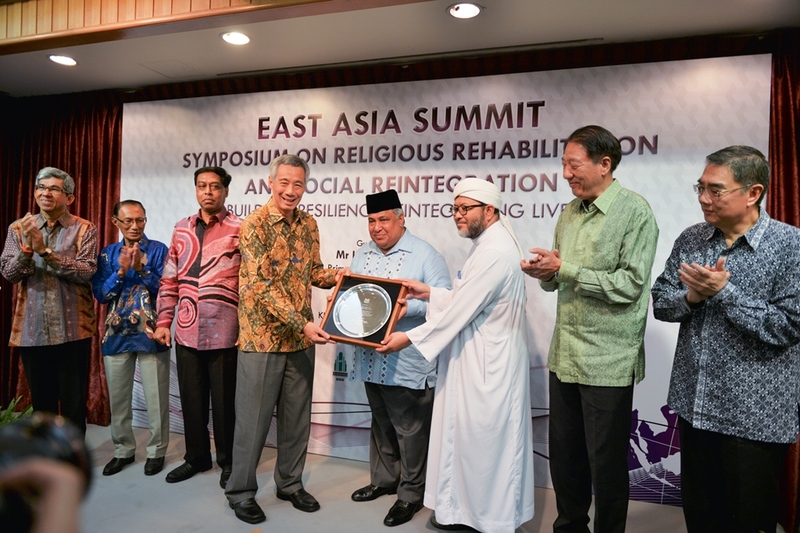 RSIS’ International Centre for Political Violence and Terrorism Research (ICPVTR) organised the East Asia Summit Symposium on Religious Rehabilitation and Social Reintegration on 17 April 2015. The symposium, which attracted more than 550 delegates from over 30 countries from East Asia and experts from around the world, was held at the Ritz-Carlton, Millenia Singapore, and the closing session at the Khadijah Mosque from 16-17 April 2015. The symposium’s focus was to map current and emerging threats of the Islamic State (IS), its global implications and how the government and civil society should respond. During the closing address, Mr Lee Hsien Loong, Prime Minister of Singapore, called for greater partnership between the government and community to mitigate the ideological threat of terrorism. Ambassador Ong Keng Yong, Executive Deputy Chairman of RSIS, said that specific strategies will be evaluated to explore the necessity and impact of aftercare programmes as part of the larger social integration process of rehabilitated terrorists. Mr Teo Chee Hean, Singapore’s Deputy Prime Minister, Coordinating Minister for National Security and Minister for Home Affairs, noted the escalation of the threat from jihadi terrorism with more 20,000 foreign fighters traveling to Iraq and Syria, and how it is integral to reintegrate and rehabilitate these returning fighters. U.S. President Barack Obama’s Special Envoy to the Global Coalition to Fight IS, General John Allen spoke about the international response and means adopted to counter the threat of IS on the ground. Professor Rohan Gunaratna, Head of ICPVTR, delineated the current and emerging threat landscape, and identified strategies to counter IS and its associated groups. Key aspects identified during the symposium were online and offline radicalisation, means to counter terrorism, the promotion of moderation and the rehabilitation of radicalised terrorists and their extremist supporters. The Strategies on Aftercare and Reintegration (SOAR) Network, which will be managed by ICPVTR, was launched at the end of the two-day summit. A network primarily for scholars and practitioners, it aims to explore emergent key challenges that have impacted the terrorism landscape, as well as on-going efforts at rehabilitation and social reintegration.